Love and miss you desperately. Thank you, Greg Daniels. You will forever be the greatest. Thank you for existing. Happiest anniversary to The Office US aka best tv show ever. I love you the most and I thank you for being a part of my life. I miss this show and coming to this website every day! Thanks for the memories! I knew the anniversary was close. Thanks for the reminder and all your work over the years, Tanster. Still my favorite show! I miss you guys! Ditto Cayce80….love this show so much and miss it…no must see for me anymore. Ah, all the feelings whenever I watch the opening credits. I miss my favorite show! Thank you, tanster, for contributing SO much to this online Office community! It was sad to come here a couple weeks ago and find comments disabled. So happy to see the show celebrated again! Koos, thanks for being such an awesome longtime OfficeTally reader. And 246 comments, wowzah! Thank you, Greg, for the links! Thanks for all the hard work over the years, and congrats to you on everything Tanster! Not sure I will ever be as engaged with a show they way I was with the Office. It was ridiculous yet real, silly yet poignant, intellectually challenging while great mind candy, the best that TV can be mixed in with missteps that could make you cringe. Many thanks to the entire team for providing genuine entertainment. Any many many thanks to Tanster and Office Tally for providing daily news about The Office and a forum to find others who were a little bit obsessed! There was a time I checked this site every day as my main source of all things The Office. The world has changed enough that one website doesn’t make that kind of difference any more but I am glad Office Tally was part of the whole experience! 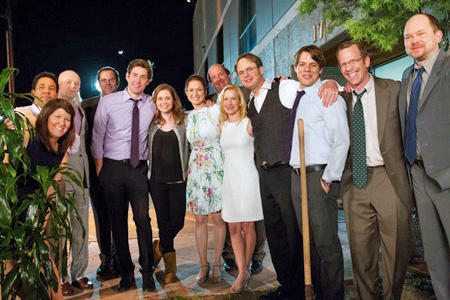 The Office is a show that will be missed over, over and over again. Although it spent 10 years since its release, I’ll remember most of the things I enjoyed from the series. Every actor has been good. I remember being the first in my circle of friends to watch the US version of ‘our’ The Office. And how i fell in love with the show. Still my favourite series. The show should have probably ended with Michael getting on that plane because that episode was perfection and it was never the same without him.